Why Am I Doing This? : The best kind of race is the one shared with friends. The best kind of race is the one shared with friends. I have been trying to figure out how to start this post. What was the most important thing that came out of this weekend? What do I want my focus to be? Medals? Awards? P.R.'s? While we got all of those (I'll talk about that later), the thing that this weekend really highlighted was FRIENDSHIP. 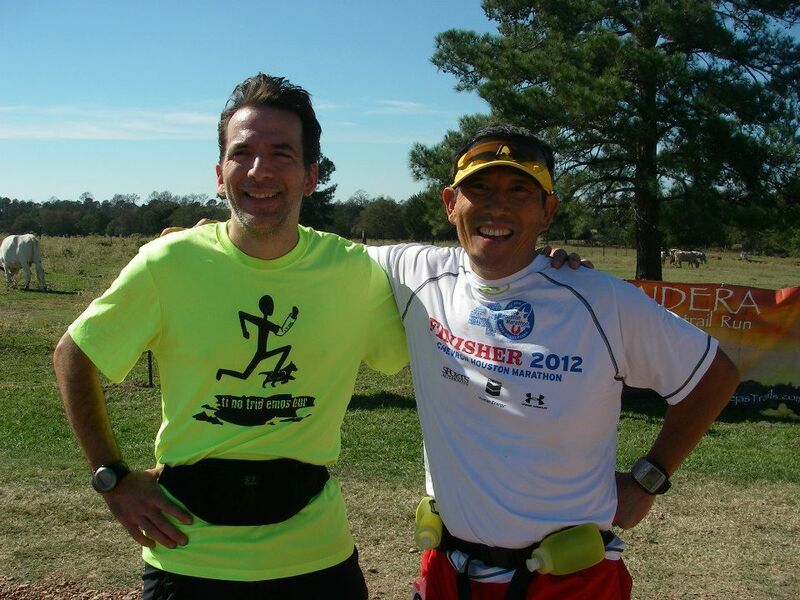 A friend is one who helps another friend reach his time goal in his first ever ultra marathon. A friend is one who gets up out of their warm sleeping bag when it is 30 degrees outside and their race doesn't start for hours, just to see you cross the starting line. 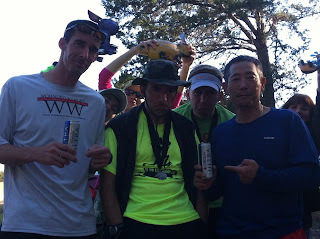 A friend is one who hangs around the finish line after they have spent HOURS running and are ready to relax with a beer, so they can be there to cheer for others who are still running. Friends are people that you can sit around the fire with and talk and laugh with until your face hurts as much as your legs from the race you just finished. Aaron and Molli Davis completed their first 50k together. How many married couples can say that? If they can make it through that, they can make it through anything!! 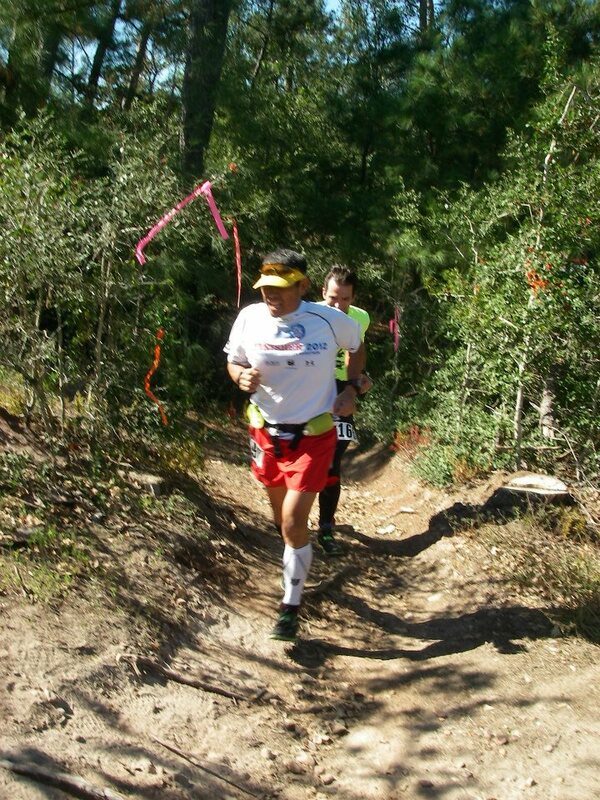 Tim Gill (white shirt) paced John Robideaux to his first 50k finish! Great job John - suffering is always better when shared! And thanks to Tim for helping John reach his sub 6 hour goal finishing at 5:57! Our 25k'ers! This would be Dustin's first 25k on trails! Rounding out the cast of characters is Karin Gill competing in the 50k, and me doing the 50 miler. Like most ultras, this one can best be described as LOW KEY. 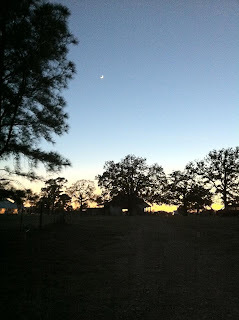 Josh and I arrived at the ranch where the race would be held on Friday afternoon to set up camp. This is a beautiful place, and about as friendly and laid back as you would expect from Texas which is one of the many reasons I really love running in that state! Home base for the weekend. These potatoes are cut into bite sized bits, boiled and cooled the day before the race. On race day, they are served with a bowl of salt next to them. I know, it sounds strange, and I had never eaten them at a race before this one, but ironically the very potatoes I am chopping may very well have saved my race. More details on that later. 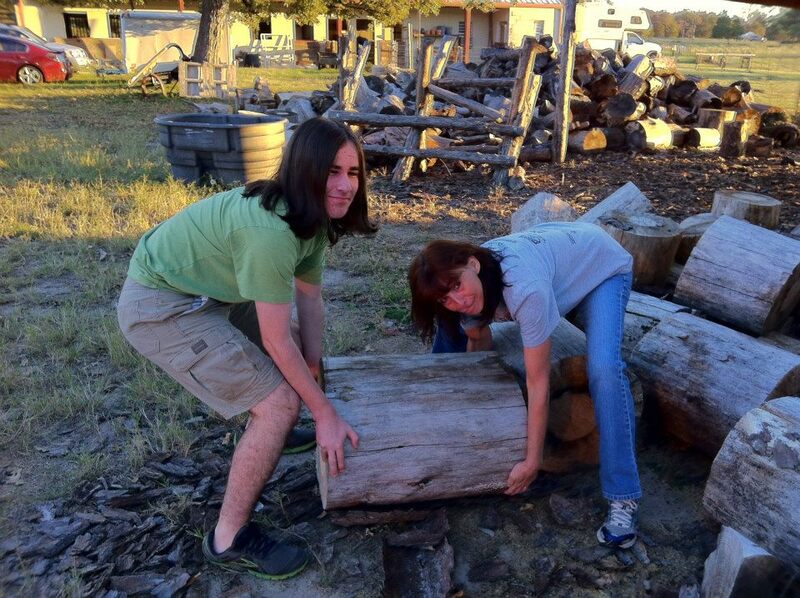 So, once more of our crew arrived, it was time to gather fire wood. How do ultrarunners get to be so strong? Ummm - that one may be a little too big. 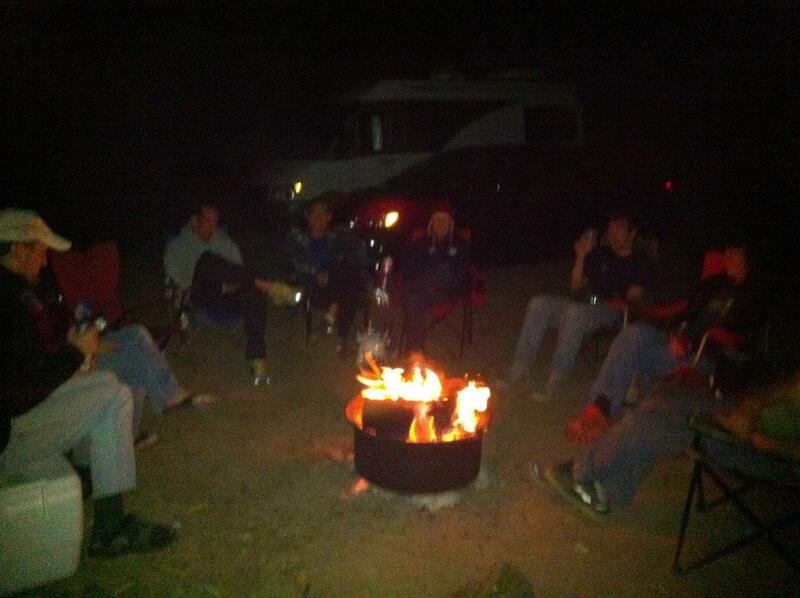 Once that was done, it was time to settle in to our campsite and get the fire going. The temps got down to the upper 30's the night before the race, so the fire was very welcome. We visited for a while around the fire while we ate, then we all turned in. Big things to do in the morning! 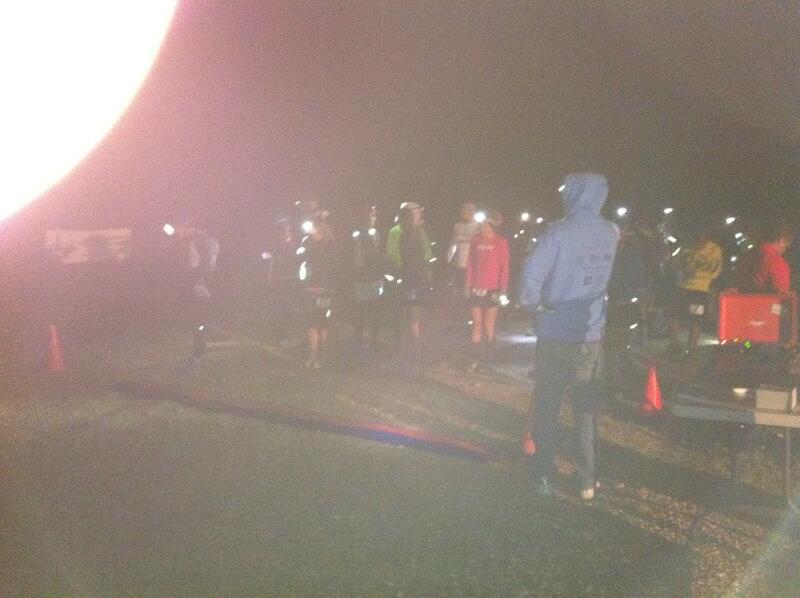 The 50 miler would be starting before sunrise at 6 a.m., the 50k at 7 a.m., and the 25k and 10k at 8 a.m. Even though there was no reason they had to, Christina and Liz decided they would come down to the start with me to see me off in the morning. How awesome is that? Leaving a warm sleeping bag and soft pillow to freeze at the start line. Friends. 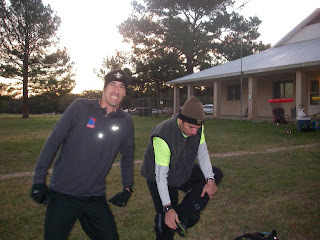 So, that night I put on my running clothes and got everything else lined up for in the morning: race number trimmed to fit on my leg and safety pins already in the corners, handheld filled and iPod in the pocket, waist pack filled with waffle, gummies, chapstick, and salt pills. feet taped and socks put on, and shoes by the door. All I needed was about 15 minutes to get my gear on and get to the start line - that is my favorite part about camping at the race site. Well, that was a good 7 or 8 minutes wasted. Since now it would be one 11 mile loop followed by 5 - 7.8 mile loops, these calculations would not help. Well, at least I had an idea how fast I needed to run to reach my goal of coming in under 11 hours (last years time was 11:13). I would need to average about a 13 minute pace for 50 miles including bathroom breaks, stopping for a few minutes at the aid stations, and walking while eating. But, conditions were favorable for this to happen. 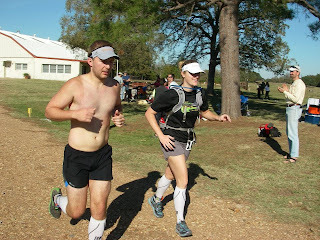 I was just coming off of Cactus Rose 50 miler three weeks before, and I was mostly healed from that and feeling very strong. 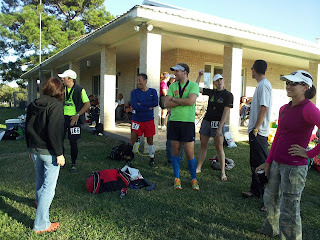 I was also very familiar with this course, having run 14 loops of it over the last two years' 50 milers. And - oh yeah - for the second race this year - Cactus being the first - the weather would be PERFECT on race day. So now it would be a little tougher to track my splits to make sure I stayed on my game, but there is always a way, and with the help of my trusty $30 Timex, I knew I would get it done. The 50 milers waiting for the start. Pretty laid back bunch. And we're off! That's me in the lime green jacket :). It was pretty chilly for the start which is always a good thing. I have raced enough in Texas to know that once the sun gets overhead it gets warm quickly, so I wanted to cover as much real estate as possible before that happened. 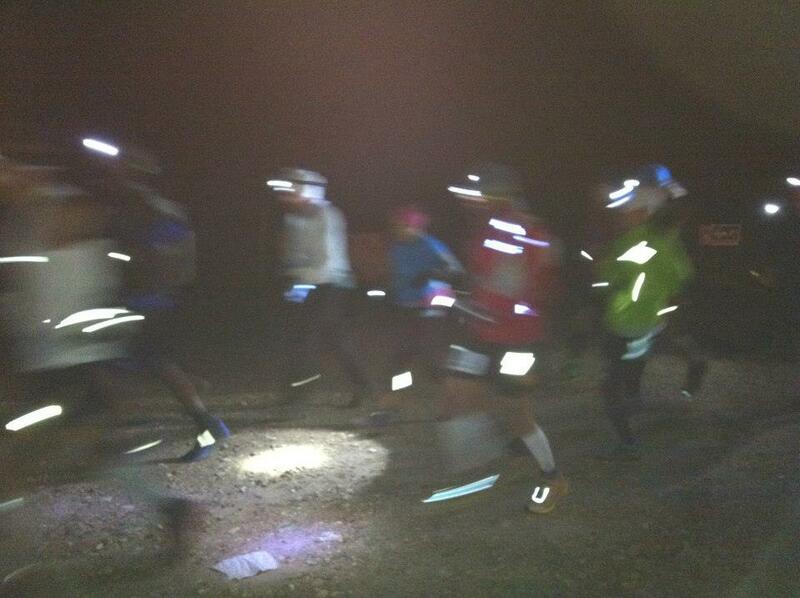 The first few miles were single track trails in the dark, so everyone kept in line for the most part. Once the sun was up and we could see without headlamps, the pack started speeding up and spreading out a bit. 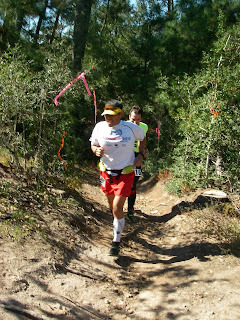 This is when I decided to push my pace while it was still cool and bank some time. I know, I know, some of you race veterans are cringing at the thought of banking time in a race. The theory is that Jack decides he will bank time in the beginning of the race to give him a little leeway later in the race. The reality usually is that Jack goes out way too fast, and ends up crashing so hard later that he finishes slower than if he had started off conservatively and finished strong. Yeah, I know all of the lecture material - I used to coach it. That is usually how I run these races, but this one was different. I had a real time goal and I felt very strong, and really, I wanted to see how long I could hold on. The result surprised me. The only potential glitch I came across were leg cramps in the third loop. 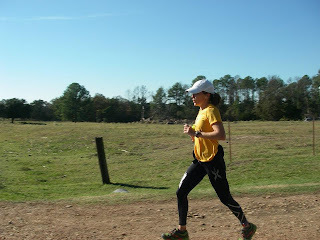 Actually, they weren't full on leg cramps but twitches in both calves and my right hamstring that were letting me know that things were about to turn against me. I stopped at one point to stretch the hamstring by throwing my leg up on a fence which was immediately followed by that legs quad muscle seizing up. Fun times, folks, fun times. 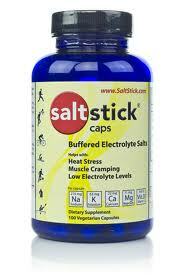 Many times, leg cramps like this is a combination of dehydration and a sodium deficit. 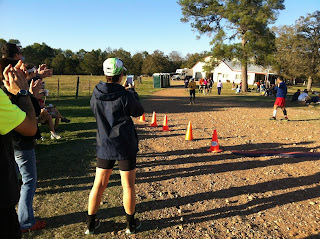 The way I usually track my hydration during warm races is by paying attention to my arms. Weird, right? If my forearms are still wet with sweat, I know I am taking in enough hydration. I can't go by the number of times I have urinated because I can run almost an entire 50 mile race without peeing and be just fine. But, my forearms were dry but when I would run, the water would slosh in my stomach. So - I was drinking but it wasn't being absorbed. At this point I doubled up on my salt intake - I had been taking one Salt Stick capsule an hour, so I increased it to two. Also, when I pulled into the next aid station, I told Henry Hobbs, a veteran ultra runner and professional aid station volunteer, and he suggested potatoes and salt. I ate a couple of those, drank some Coke and headed out. Before I knew it, the leg cramps were subsiding and my stomach was no longer sloshing. Mission accomplished. 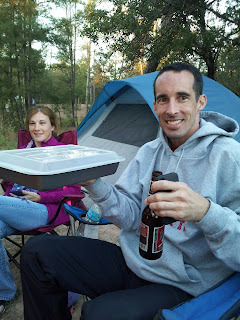 From this point on at every aid station I hit the potatoes and salt and had no more cramps. So, instead of 7 laps there were 6. The first one was 11 miles, followed by 5 - 7.8 mile laps. There were two aid stations on each lap - one about 3.5 miles in, then the start/finish about 4.3 miles after that. 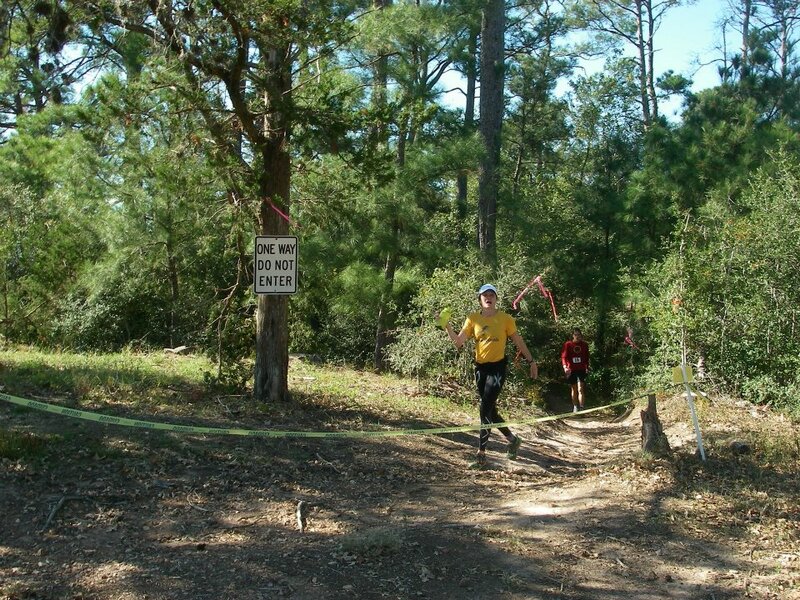 Being familiar with this course, I know that the second half of this loop is much faster for me. There are some steep climbs and descents, but they are very runnable. Especially the descents. As much as I am a chicken at Cactus Rose with descending on those rocks, this hard packed dirt, or even cemented descents are like a playground for me. Keep in mind, this trail is mainly a mountain bike trail, so lots of the steep descents are followed by a turn where the outside corner is built up where the bikes can ride up the bank, then continue the descent - like a switchback. This is AWESOME to run!! I can't lie - I was making race car noises in my head every time I would get to these. 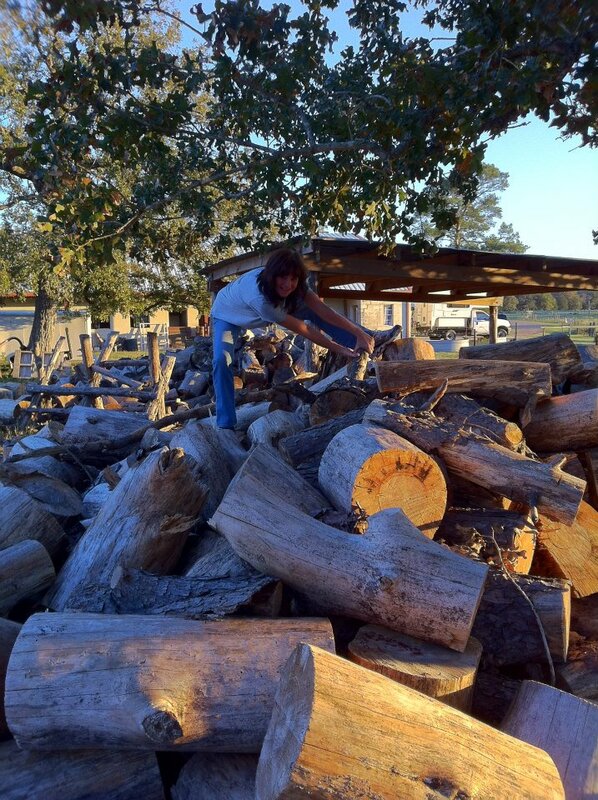 This was play time!! Every time I would get to this particular descent I would laugh out loud and plow forward as fast as I could down the hill, run up on the bank in the turn, then continue down the other side. 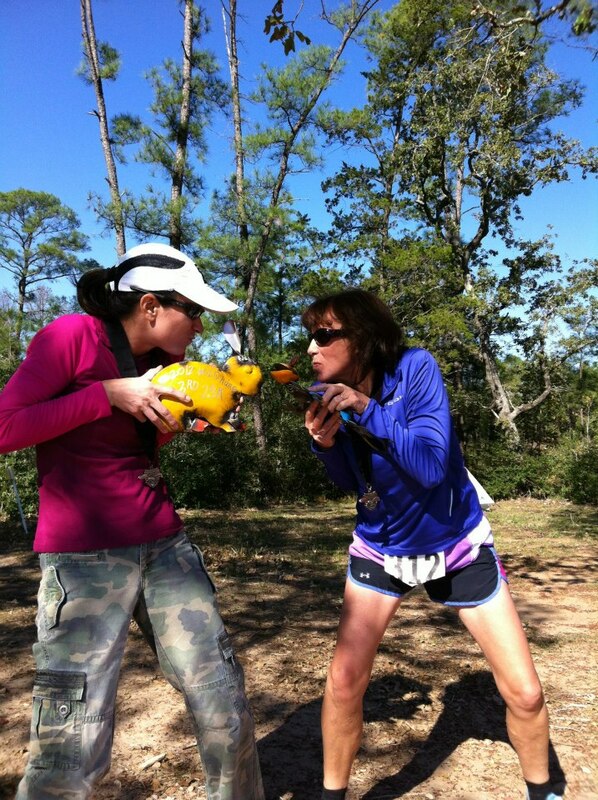 :) Fun stuff! my watch read 4:14. WHAT???? THAT is impossible. Yeah, I had been doing the mental math and tracking my splits, but that is almost an hour p.r. 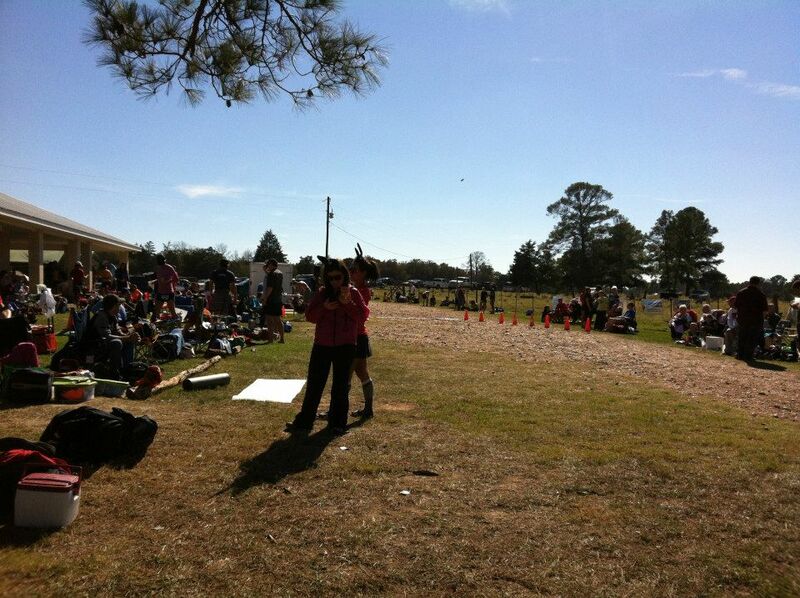 on this course!! WOW! 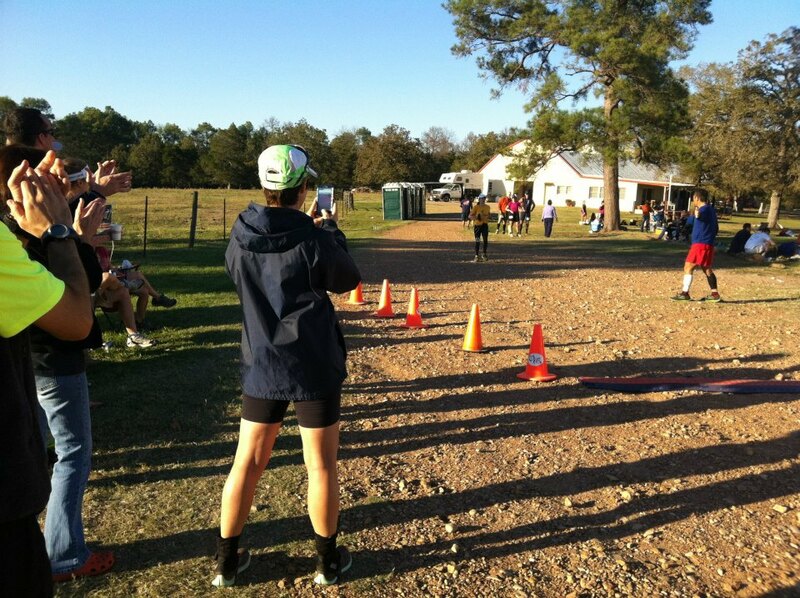 So I ran through the barn for the last time, turned the corner and saw the finish clock - 10:15. Was I thinking, "Woohoo! I rock!"? No. I was thinking, "Don't cry dammit!". Christina on the left waiting for me. When I crossed the finish line, the Race Director, and an all around class act, came up to me and said, "I was wondering if you would be the next one to cross the finish line." I guess I looked confused because then he smiled and said, "Because I only have one trophy left." At which point he handed me my bunny (Wild Hare, remember?) and I started to cry. Causing him to smile and give me a big old hug. Finish line hugs are the best, and Joe and his wife Joyce are pros at this! I started this race just wanting to beat my previous time on this course of 11:13. That is one of the reasons I repeat some of the same races every year. While with road races, you can compare your times somewhat between different locations, with trails, no two races are alike. 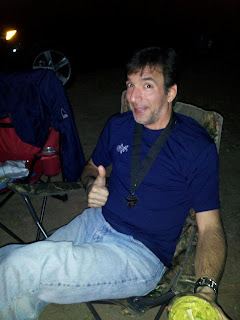 A few weeks ago, I worked my a$% off at the Cactus Rose 50 miler to finish in 13:28. At the Wild Hare I really wanted to break under 11 hours, but I would settle for anything under 11:13. I NEVER imagined I would come in at 10:15. Hopefully this gives you some idea about how important it is to choose your first ultra wisely. The terrain makes a BIG difference! in a box under my bed. So, back to the point. 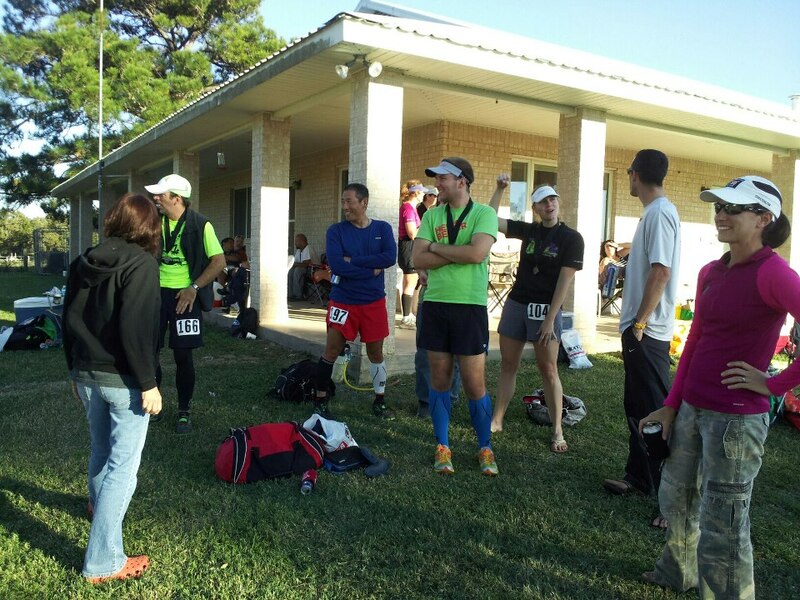 While I was out running, once everyone was finished with their races and ready to sit down by the fire, what were they doing? It hurt worse after I saw it :). In comparison to previous years on this course, this is pretty mild, so I'll take it. Despite the advice of some, I drained and taped it, then joined the rest of the crew around the fire pit. This was the best part of the weekend. War stories and lots of laughs. So I left with a surreal feeling. 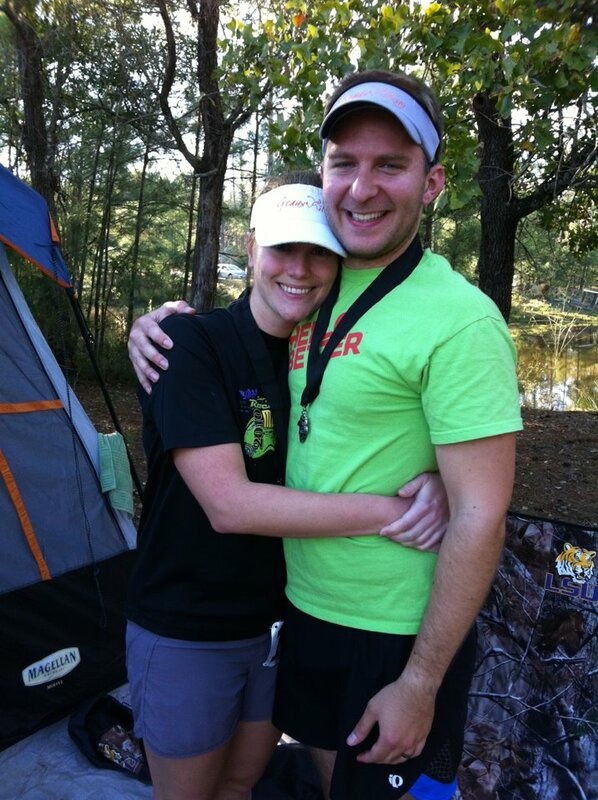 Did I really just run a 10 hour and 15 minute 50 miler on a tough course? What the hell happened? Huh - maybe all those runs during the summer with me trying to keep up with my fast friends are paying off. 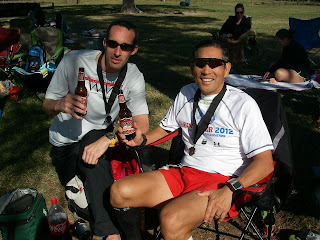 Maybe experience is on my side now and little things like blisters and muscle cramps no longer threaten to sideline me. I also think that I understand the nuances of these distances better these days. I know that the highs and lows come harder and faster than normal distance races, and I have learned how to use them to my advantage. When a high comes, ride it. Run like there is something chasing you and enjoy every second of it. When a low comes, it means something. Either I am behind on my fueling or hydration. Use that time to assess the situation and fix it, slow my pace a bit, and wait for the fix to take effect because it always does. I will always be learning about this sport, and that is what makes it interesting to me. Dustin picking on a nervous John before his first ultra. with the bells on her shoes." back to Louisiana with us! The post race beer. At least the first one! Good thing the girls weren't rubbing it in. Our group (minus Josh our crew dude - he's taking the picture). Gotta keep up with your hydration. Gag gift from my friends. Think they are trying to tell me something? This is me having the last laugh.